In this document, we use the same hardware and software available to the Deadliest Warrior crew to perform our own bike helmet test. We don't have cool, replica heads to test with but we've got the next best thing-watermelons! Check back here for the upcoming video and see the technology behind your favorite Deadliest Warrior tests! This section of the document describes how the bike helmet test was setup and performed. It specifically discusses how both the hardware and software portions were put together. From the Deadliest Warrior product bundle, this test used the NI CompactDAQ-9178 chassis, the NI 9234 input module, the NI 9401 digital I/O module, and the NI LabVIEW Full Development System. We also used NI Vision Acquisition Software and a FireWire camera capable of acquiring images at 60 frames per second for a better look at the falling melons. 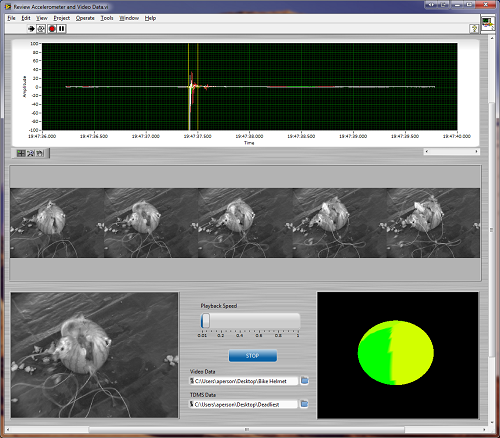 One of the most important features of this test was synchronizing data from the accelerometers with the video frames. This was accomplished by configuring the camera for hardware triggering and routing the sample clock from the accelerometer task to the camera. The challenge here is that the NI 9234 needs to sample much faster than the camera can acquire frames. We had to divide the sample clock down to a 60 Hz pulse that the camera could actually read for acquiring frames. We did this by using a counter task on the NI 9401. The sample clock from the NI 9234 provided the timebase for the counter and the NI 9401 generated another signal with one pulse for every x ticks calculated to output a 60 Hz pulse train. The 60 Hz pulse train was routed to the PFI0 line of the chassis which was connected to the trigger input of the camera. Once the routing of the timing signals was configured, we programmed the software to simply acquire from the NI 9234 and FireWire camera and save the results to TDMS and AVI files, respectively. After we performed our test and saved the data, we used another VI to open the TDMS and AVI files and allow us to review the data as seen in the following screenshot. This view of the data allows us to most effectively analyze the results by seeing the exact moment of impact both numerically in the accelerometer data and visually in the video playback. Want to get your hands on the bike helmet test data? All you need is LabVIEW and the Vision Development Module. Download the code and data and start reviewing! Don't have the software? Get an evaluation copy!